What are the Commencement fees? These fees will appear on your student billing statement and cover the charges for your regalia unit, ceremony, and reception. Tickets are only required for Spring Quarter commencements. Tickets may be picked up and signed for beginning Wednesday of the 7th week. The size of the graduating class will determine the number of tickets allotted per graduate. The average number is five per graduate. You may pick up your tickets in the Office of Student Life in CC-377. If you need more than you were allotted you may obtain them from other graduates, or obtain them on a first-come, first-served basis, if available, from Student Life on Wednesday, Thursday and Friday of the 9th week. I have not been contacted, am I graduating? All correspondence is e-mailed to the address you list on your Graduation Application. Contact the Student Life Office if you have not been contacted about the ceremony by the fifth week of the quarter in which you are graduating. Where can I order my invitations and announcements? How can I get more? Customized invitations, announcements or name cards may be ordered via Jostens. How much does my family have to pay to park on campus for graduation? Good news! Free, no time limit parking will be available in the MSOE Viets Field parking structure. The general timeline is two hours from start to finish. Spring Commencement usually runs 20 to 30 minutes longer. Is there handicapped seating and service for the hearing impaired? Handicapped seating will be available on the main floor for Fall and Winter Quarter commencements. Spring Quarter handicapped seating will be available on the mezzanine level behind section C of the ice arena. If there is a special need for the hearing impaired, contact the Office of Student Life. There are no reserved seats, except for the graduates and special commencement guests. Public seating is on a first come, first served basis. Who qualifies for honor cords? In order to receive an honor cord you must be an undergraduate student and have a cumulative GPA of 3.2. 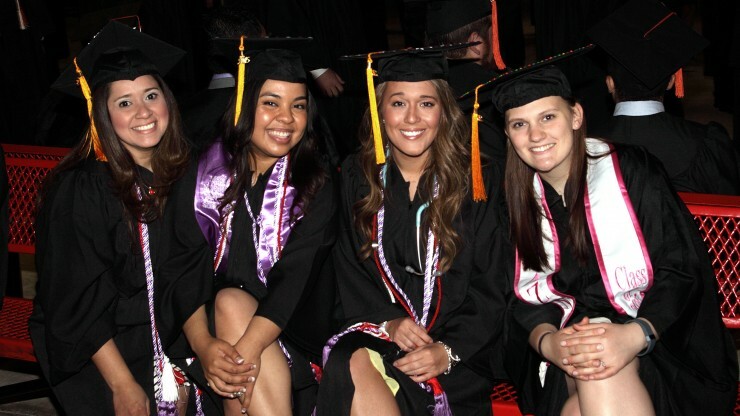 Master’s candidates do not get honor cords, as graduate hoods denote the honor automatically. Diplomas are sent to you after graduation and all academic requirements and payment of any monies owed to MSOE have been completed. How can I purchase a photo from commencement? Two snapshots of all graduates accepting their diplomas will be taken by Gradtrak Graduation Images, which also provides a pre-registration system on their website for graduates and families to view proofs and place an order. NOTE: When visiting the Gradtrak website type "Milwaukee School of Engineering" in the school/organization search box. Will I need a gown, cap, etc.? You graduation fee includes a keepsake cap, gown and if applicable, a masters hood. These items will be distributed from the MSOE Bookstore (Campus Center, 3rd Floor) during regular operating hours one week prior to graduation. Contact the Student Life Office, CC377 at (414) 277-7225.